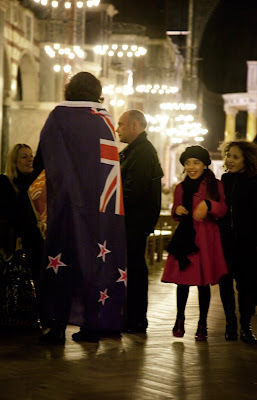 Last night thousands of kiwis and friends held a vigil at Westminster Cathedral. A cold evening didn't deter those who couldn't fit into the Cathedral and filled the square outside to listen to stories of friends and family back home. New Zealand's biggest natural disaster ever. It will take 15 years to rebuild this once beautiful historic city. Letters were read out from those who have lost everything but remain positive and help one another. A Maori choir sang How great they are and Haley Westenra sang the NZ National Anthem bringing tears to the eyes of every kiwi. I am sure it was very moving. We have family in New Zealand - and they are all rather shellshocked at the moment. We were there just over a year ago and it is hard to imagine Christchurch in such disarray. Beautiful. New Zealand is filled with resilient people, I know they will come back stronger. My heart goes out to them. I think, it's good to meet with friends in a time like this, talking and listening. What a wonderful idea to have a vigil in London for the victims of the earthquake and your photo captures the ambiance that must have reigned there beautifully. So moving, a beautiful tribute. I love the photo. This is such an awful tragedy for the people of Christchurch. Unimaginable really. We stayed close the cathedral in Christchurch 10 years ago - we have neighbours who there just three days before the latest quake and flew home the day before - we are all moved by these events. It was a terrible disaster. Haley Westenra can bring tears to the eyes of every one. She is a fantastic kiwi.